A Black-tailed Deer! How excited we were to see what was for us a new species as we drove up into Olympic National Park on the road to Hurricane Ridge. The deer walked down the road, seemingly unconcerned with being so close to an open car window that revealed an excitedly babbling family and a clicking camera. Little did we know how representative of the park’s deer this one would be. And even less did we know about the taxonomy of the Black-tailed Deer, which turned out to be not a new species of deer for us at all. Let’s deal with the second issue first. 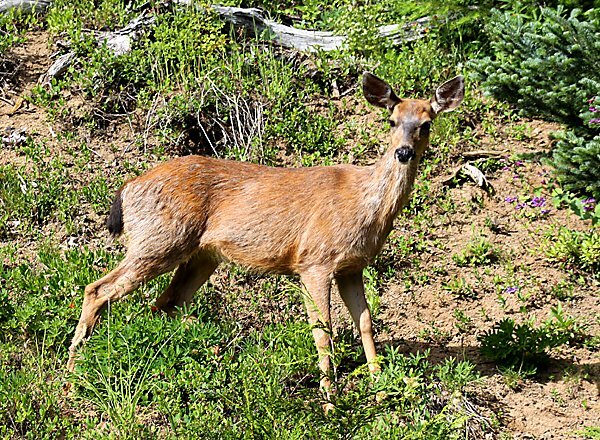 The Black-tailed Deer, or, in this case, the Columbian Black-tailed Deer, is not a full species, but one of two black-tailed subspecies of Mule Deer. * It is found from northern California to British Columbia though it formerly ranged must further east before it was hunted out of its eastern haunts. Though morphologically distinguishable from other subspecies of Mule Deer it is not a species in and of itself. Because Daisy and I had seen Mule Deer in southern California before our sighting was therefore not of a new species for us. Not that the species status of the Black-tailed Deer we saw really mattered because it was a really cool animal. And then we saw more, many more, many many more, when we reached the visitor center. We saw Black-tailed Deer walking through parking lots. We saw Black-tailed Deer searching for handouts in picnic areas. 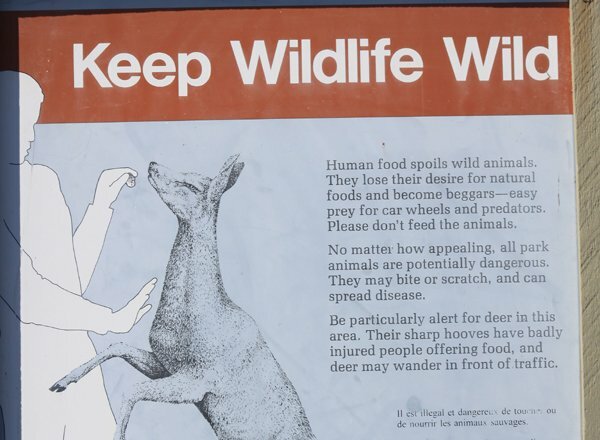 We saw families blatantly violating both the rules and common sense by letting small children hand feed very large Black-tailed Deer, a very bad idea both because it creates dependence in the animals and because the deer could inadvertently seriously injure an adult so a child is even more at risk. 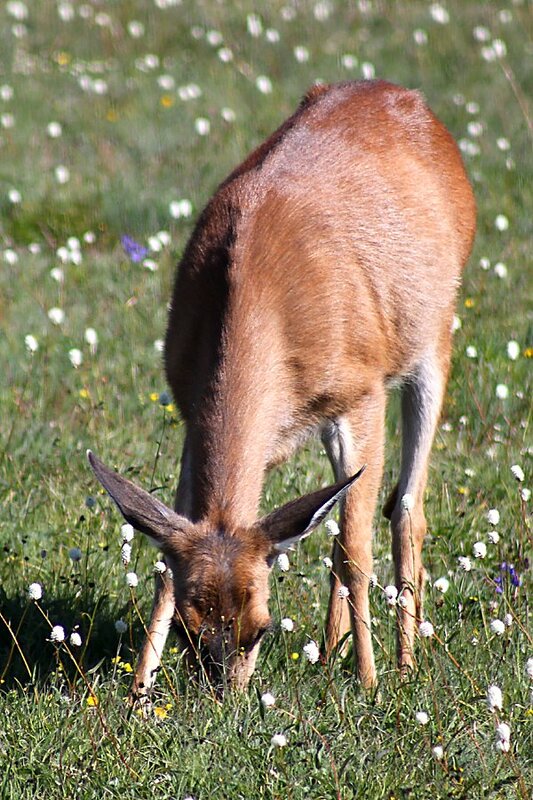 Rather than hand-feed a deer it is much more advisable to simply watch them when at Olympic National Park. There are plenty around and in the course of a day at the park you should have no problem seeing at least one up close and personal without any need to provide it with an unauthorized snack. Or, if you can’t get to the park you could just enjoy these pictures, all taken in August of 2011. But the best part of seeing Black-tailed Deer up close was being able to share them with Desi, who, at less than two years, is fascinated by everything, but especially by big hoofed animals. If you liked this post and want to see more great images of mammals and other creatures make sure to check out 10,000 Clicks, our big (and growing) page of galleries here at 10,000 Birds. 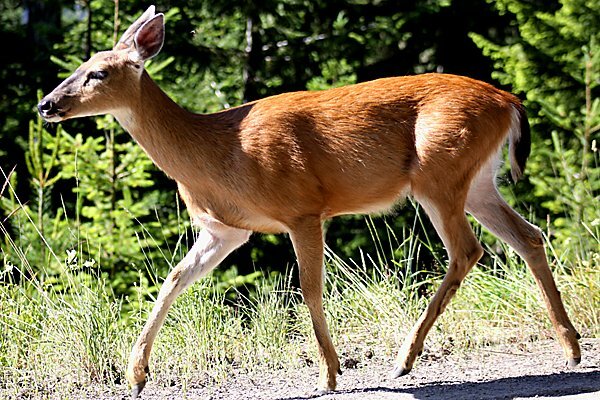 *The other black-tailed subspecies is the Sitka Black-tailed Deer O. h. sitkensis, which ranges from British Columbia up through south central Alaska. On Gabriola Island, a gulf island in B.C. 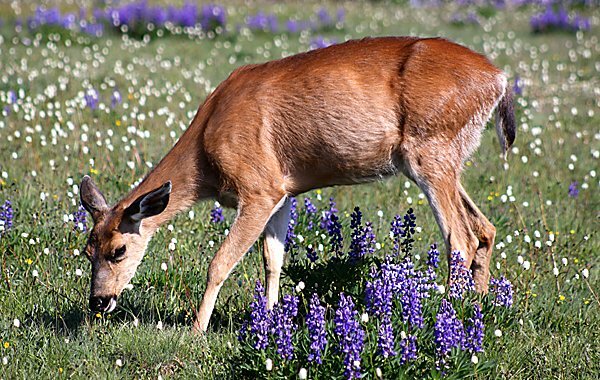 Canada, black-tailed deer abound because they no longer (because of human intervention) have natural predators here. 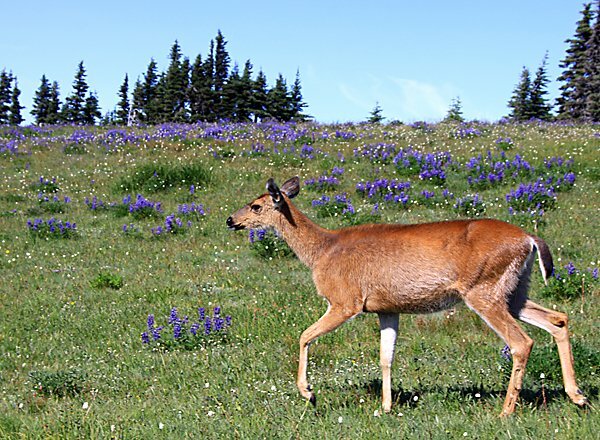 I love the deer almost as much as the birds, but became concerned in the fall when two scientists at The University of BC, Tara Martin and Peter Arcese, published a study in Biological Conservation about the results of their study of the relationship between deer populations and songbird populations on 18 islands in the Pacific Northwest. The outcome: islands that supported more than one deer per hectare had fewer songbirds than those with lower deer density. Arcese and Martin found that on islands with lower deer densities, rufous hummingbirds and fox sparrows were 9 times more abundant, varied thrush were 29 times more abundant, and the spotted towhee was 25 times more abundant. Seems the black-tailed deer graze on the forest understory that is habitat for many birds. It’s just another example of how human intervention can mess up the natural ecological cycle.